Mum gave Jack a chocolate cake. He put it into the big red bag. Then he put in the drawing he had just finished. 'Poor old Granny Small!' said Jack. Mum drove to Bluebell House and Jack carried the red bag inside. Bluebell House was warm and cosy. Twelve grannies and granddads lived there. Eleven of them looked very happy - but not Granny Small. Granny Small sat huddled on an enormous pink armchair that wanted to swallow her up. The chair was so huge and she was so tiny that at first Jack did not see her. Granny Small tried to smile. It was not a very good smile. It wobbled and trembled and then it disappeared. 'Thank you,' she said in her tiny voice. 'You will try to eat it, won't you?' said Mum anxiously. Granny looked even smaller than she had last time. Her blue cardigan fell in wrinkles around her. She was so tiny that she would have fitted into the red bag. 'I'll try,' said Granny Small. Jack couldn't imagine Granny Small climbing trees. She had lived in Bluebell House for as long as he could remember. Jack didn't want to go. He wanted to hear more about Granny Small's adventures, and the fun she had when she was little. Granny Small was still little, he thought. She was smaller than she'd ever been. So why shouldn't she still have fun? Granny Small sat dozing in her enormous chair. She looked even tinier than she had five minutes ago. Granny Small opened her eyes. 'All right then,' said Jack. And he picked up Granny Small and popped her into the big red bag. She hardly weighed anything at all. The bag was so huge and she was so tiny that he couldn't even see her in there. But he could hear her giggling. He picked up the bag and hurried out to the car. He put the bag on the back seat. It gave a tiny giggle. 'What's so funny, Jack?' asked Mum. Er - I just thought of a joke!' said Jack. 'How does an elephant climb a tree? It hides in an acorn and waits for a squirrel to carry it up!' He laughed loudly. The bag giggled again. Jack had to keep telling jokes and laughing loudly all the way home, so that Mum wouldn't notice the bag giggling. 'You're in a funny mood, Jack,' said Mum. Jack laughed some more, although he did not feel like laughing. How could he tell Mum that he had stolen Granny Small? Back home, Jack smuggled the bag up to his room without Mum seeing. Granny Small wriggled out. 'I thought we could play Frisbee,' said Jack. He showed Granny how to throw the Frisbee. She couldn't throw it very far. There wasn't very far to throw it. It spun across the room and hit the wall. Jack didn't want to take her outside, because Mum might see. He opened the window. Granny Small stood on a chair and leaned out. 'Now throw as hard as you can,' said Jack. Granny Small tried. The Frisbee hit the window. 'Try again!' urged Jack. 'We'll throw it together.' They both held the Frisbee. 'One - two - three - go!' said Jack. The Frisbee went sailing out of the window. Jack gasped in horror. Granny Small spun round and round, hanging on to the Frisbee. She whizzed through the air with her blue cardigan trailing and her thin legs dangling. And she was heading for the trees. A tiny voice called back. 'I am hanging on! What fun!' cried Granny Small, as the Frisbee swooped across the garden and landed in the very tallest tree. 'Oh, no!' wailed Jack. He raced downstairs. 'Is everything all right?' Mum asked him. 'Oh, er... I'm just going out to play,' Jack said. How could he tell Mum that he had thrown Granny out of the window? He ran into the garden and peered up at the tree, calling softly. 'Wait there! I'll come and rescue you!' said Jack. But he couldn't climb the tree. The lowest branches were too high for him to reach. He knew he should ask Mum to get the ladder out of the shed. But how could he tell Mum that he had got Granny stuck up a tree? He ran off to hunt for something big. He looked all over the garden. He even looked over the fence into next-door's garden, where next-door's dog Buster lay sleeping in the sunshine. But he couldn't see anything to stand on. Then he noticed the green wheelie-bin beside the fence. It was full of grass from when Mum mowed the lawn. 'Perfect!' said Jack. He began to drag the wheelie-bin towards the tree. 'Stay there, Granny! I'm coming!' he shouted. A parachute came swaying and floating down from the tree. It was made of leaves tied together with blue wool - and dangling from it was Granny Small. 'It's a good job I had my cardigan!' she called. 'I unravelled the wool. And it's a good job I remembered how I used to tie my rafts together!' Her blue cardigan was only half the size it used to be. Jack held his hands out wide. He was just about to catch Granny Small when a gust of wind caught the parachute. 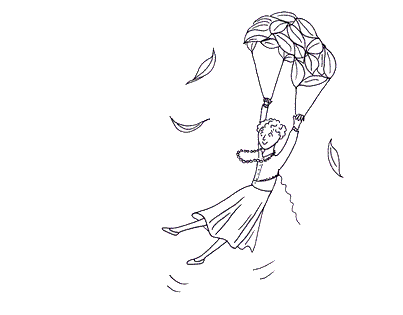 The wind whirled Granny Small back up into the air, tossing her around like a dandelion seed. 'Whee! What fun!' sang Granny Small as she sailed on the wind. She did a loop-the-loop and flew over the fence into next-door's garden. Jack ran to the fence. He got there just in time to see her land on top of next-door's dog, Buster. Buster jumped up with a yelp. He began to run round the garden with Granny Small clinging to his back. Buster raced to and fro. He leapt over the path and bounced across the patio. He splashed through the pond and crashed through the flower-beds. Then he stopped dead and shook himself, hard. Granny Small flew off Buster's back. She sailed through the air, turned two somersaults and landed on top of next-door's roof. 'Don't worry!' she said. 'I'm fine. I'll just climb across to your side.' Next-door's house was joined to Jack's. Granny Small began to scramble across the roof. Jack could hardly bear to watch Granny Small as she sat on top of the roof. She took the blue wool that trailed from her cardigan and tied it round the chimney. 'Now I'm perfectly safe!' she said. 'We've got to get you down!' wailed Jack. He knew he should fetch Mum. But how could he tell Mum that he had stolen Granny Small, and then thrown her out of the window, and then got her stuck on the roof? Granny Small slipped. She began to slide down the roof. The blue wool did not hold her. Instead it started to unravel from her cardigan. Jack had no time to think. Grabbing the green wheelie-bin full of grass, he pushed it under the roof and threw open the lid. 'Wheee!' shouted Granny Small as she flew off the roof. She landed with a whump in the wheelie-bin and was buried in the grass. Mum came storming outside, looking very cross. The wheelie-bin sneezed. Then it giggled. It fell over, and Granny Small tumbled out. She had grass in her hair and a big smile on her face. Mum scratched her head. 'Well, how did you get here all the way from Bluebell House?' she asked. Granny giggled. 'I must have flown,' she said. 'We'll have to take you back!' said Mum. Mum hurried inside. Granny Small winked at Jack. Jack began to laugh. Granny Small began to giggle. See the list of free stories.